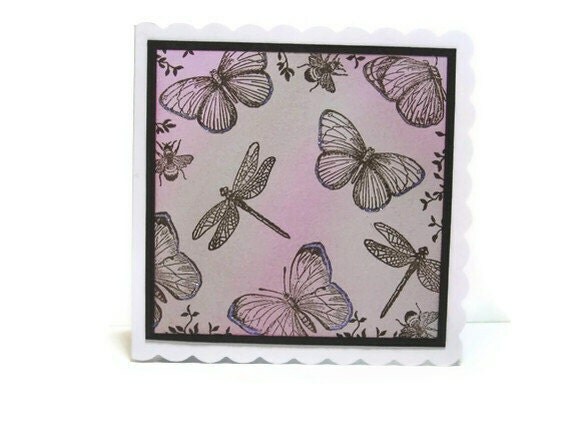 A vintage inspired blank card featuring butterflies, dragonflies and bees in shades of rich browns and pinks. The card size is 6" x 6" has a scalloped edge and is a pure white base card. The images of butterflies, a dragonflies bees and vines have all been individually hand stamped in a rich brown ink onto a pink and light vintage brown inkdusted base. This has been matted onto a rich brown base before being matted onto the white base card. A hint of glitter has been added to the butterfly wings giving a hint of blue and purple as this card catches the light. The inside of the card contains a plain white insert which has been left blank for you to add your own personal greeting. The card comes complete with a plain white envelope and is cellophane wrapped for protection.